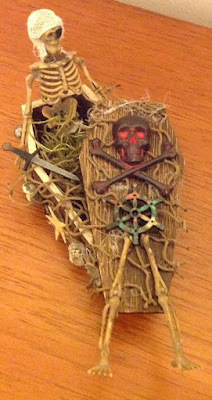 As soon as I saw Sherry's tombstone project, I knew what had to be done. And I couldn't stop at just one! I hope you love them as much as I do. Worth another look: If you missed the Artisan Powder video I posted last week, you can catch it HERE. Art Time Feature Chrissy Colon! 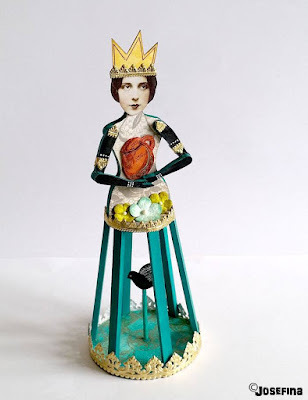 "Fight for the fairy tale, it does exist", by Amy Nieman! A beautiful collage with a beautiful message. We're loving the amazing colors and cool textures. Wonderful as always Amy! 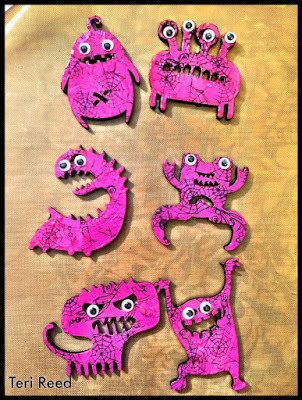 These absolutely adorable Misfit Monster Magnets by Teri Reed are making me giggle this morning! 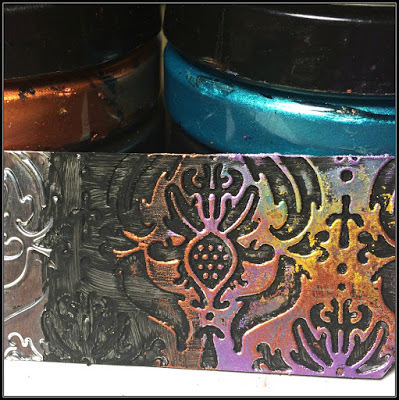 The color and stamping is perfect, and oh, those EYES! So much fun Teri! We love them! 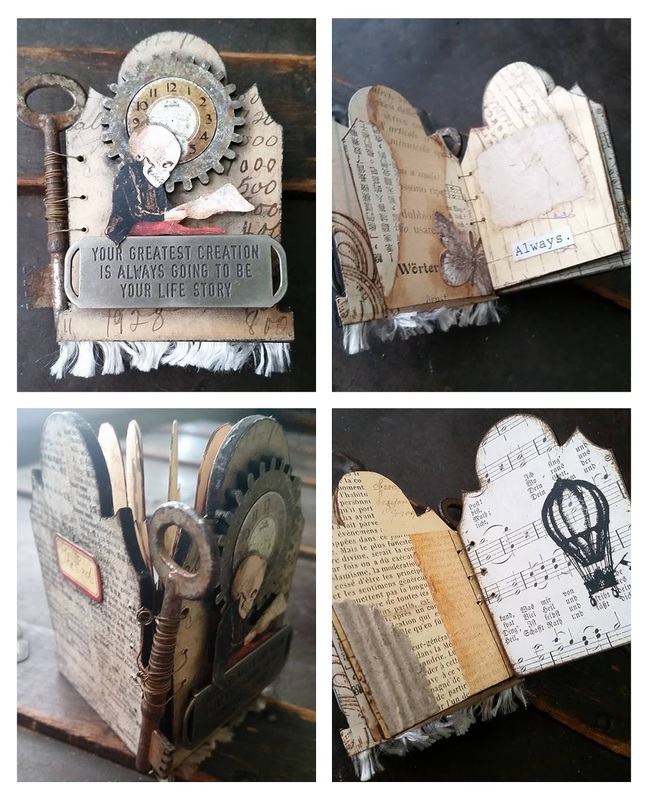 We're so in love with this Tombstone Book by Design Team Member Sherry Matthews! 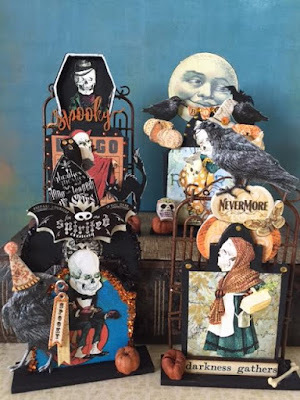 Such a clever way to use those Tombstones, and so cool how this spooky journal can stand up, displayed on a table or shelf! 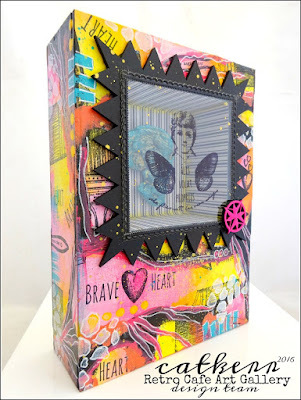 This piece is so inspiring Sherry. Love it! Happy Weekend Everyone! The gorgeous new Artisan Powder Colors are in the shop and ready to ship! I love all four colors, however I think French Sage is my favorite! I'm also partial to Antoinette Pink as well, but part of that may be the cool name! 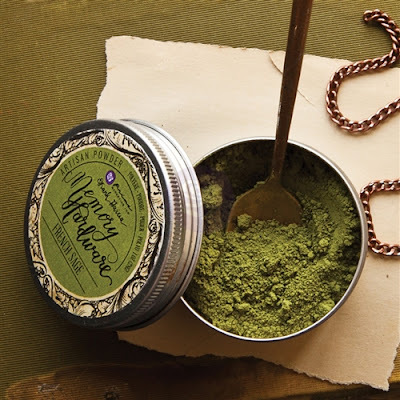 If you missed the Artisan Powder video I posted last time, you can catch it HERE. While I was perusing Youtube, I also stumbled across and amazing Rust Paste Camera video and photo by Anna Dabrowska (Finnabair)! And since we just received more Rust Paste stock, I thought I would share. Check it out HERE. Art Time Feature Cat Kerr! 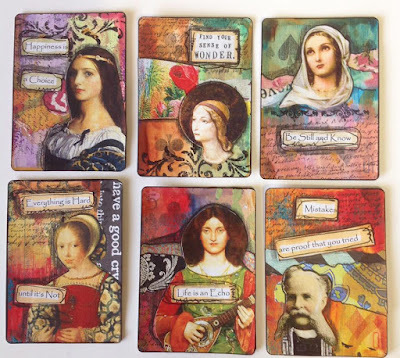 Stunning ATCs by Design Team Member Kim Collister! Such beautiful colors and sentiments! So lovely Kim! Bonnie Ashurst is sure to make you smile with her fun and funky "Halloween Bingo Caller"! We love how creatively she used our Paper Mache Skull. He has so many wonderful details, including his thick spectacles! Awesome job Bonnie! 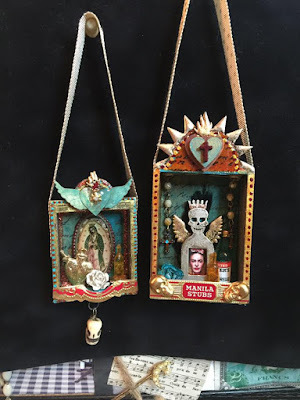 We're loving these gorgeous DOTD Ornaments created by Sandra Brandt! 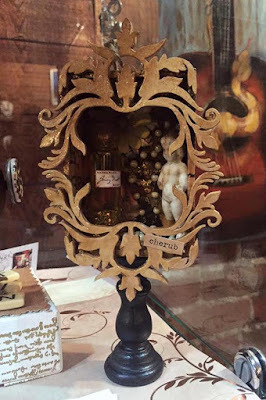 So many wonderful details, including the way she cleverly used those cigar bands! Beautifully done Sandra! The Tombstone Contest is Underway! Tombstone photos are due October 14th! So you still have just under a month to play along! I created not one, but TWO Digital Collage Sheet prizes for everyone who plays! If you've submitted a photo already, your Collage Sheets have been emailed to you! If you don't see them, check your junk email box and let me know. Sometimes things get lost in cyber space. I hope you enjoy "Pumpkin Patch" and "Witching Hour", created especially for the challenge! And special thanks to Sherry Matthews for the cool skeleton dictionary page image! Happy Weekend Everyone! We have some fun new goodies in the shop! Awesome Dimensional Embellishments, cool beads, and oh my that Paper Mache Skeleton! 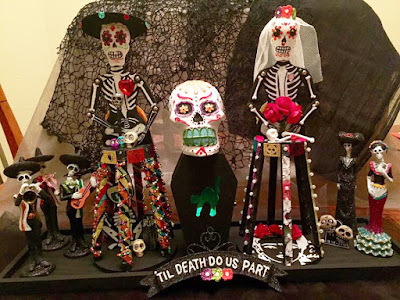 The skeleton is super cool on it's own, but you can also embellish him or her further with rhinestones, flowers, lace, and more! Art Time Feature With Sherry Matthews! 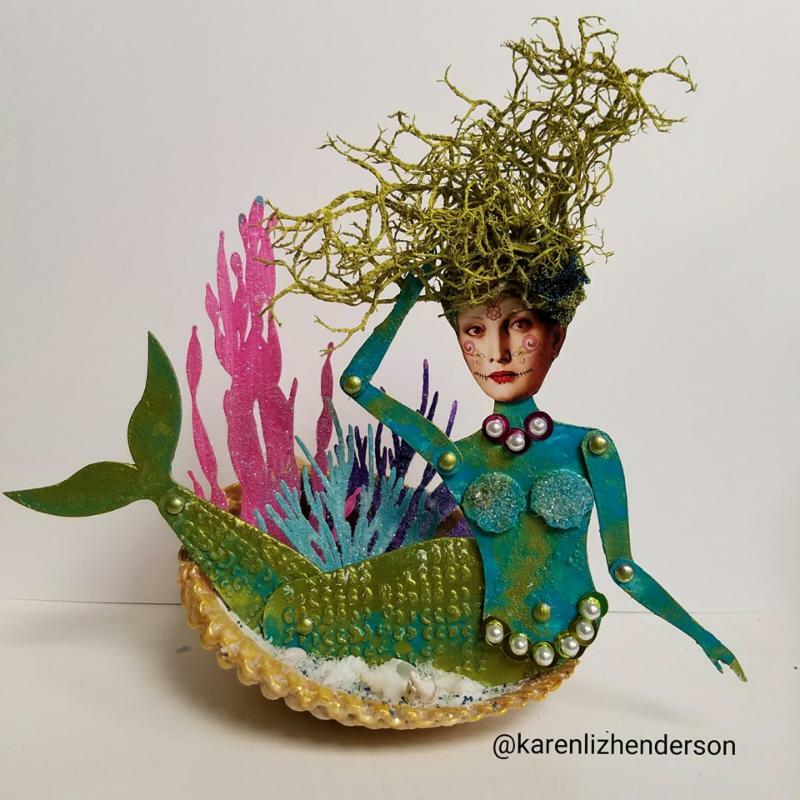 We are in love with this Sea Maiden by Gena Boone-Curtis! The texture is absolutely brilliant. Notice the beads? And we love the maiden's flowing hair! Incredible piece Gena! 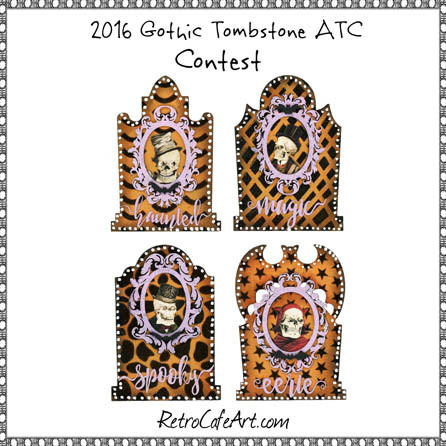 Design Team Member Kim Collister has some wonderful tombstones to share with you! They are sure to inspire. 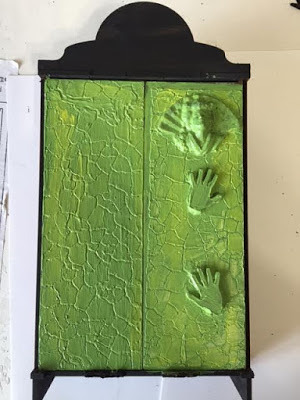 Hop on over to Kim's blog post to have a closer look! 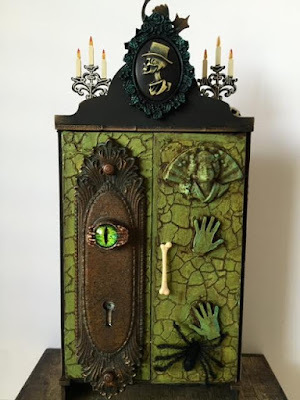 She also posted some incredible pieces from last year that are definitely worth a second peek! This amazing DOTD ensemble was created by Cindy O'Neall! We adore how she transformed the Santos Dolls to create this festive pair! Don't miss all the wonderful details! Just fabulous Cindy! Happy Weekend Everyone! 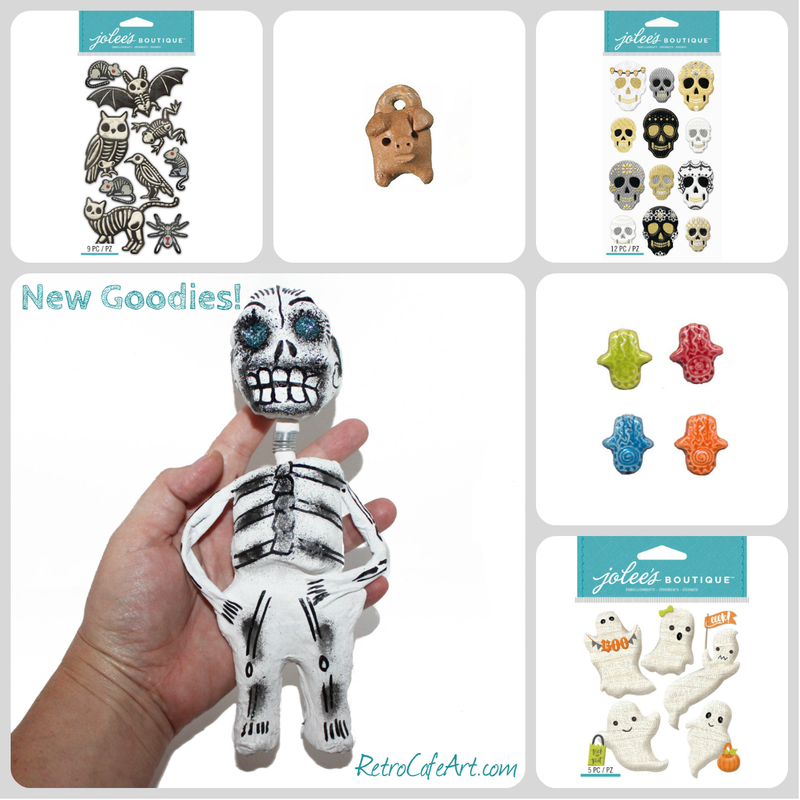 We have some really fun new goodies this week! Of course our favorite are the brand new Misfit Monsters! HOW scary cute are they? We can't wait to play! 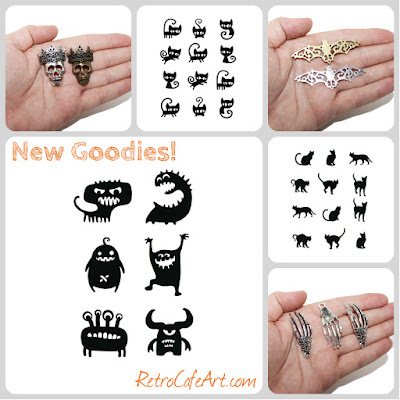 And the Mischievous Cats and Black Cats now come in a super handy MINI size! 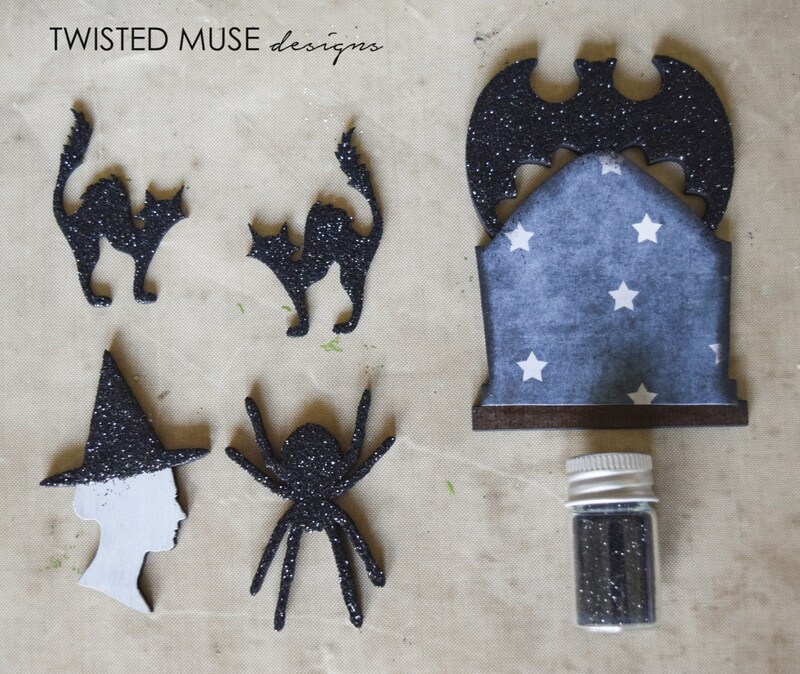 We also have several new must have Halloween Charms waiting for your Halloween and DOTD projects! 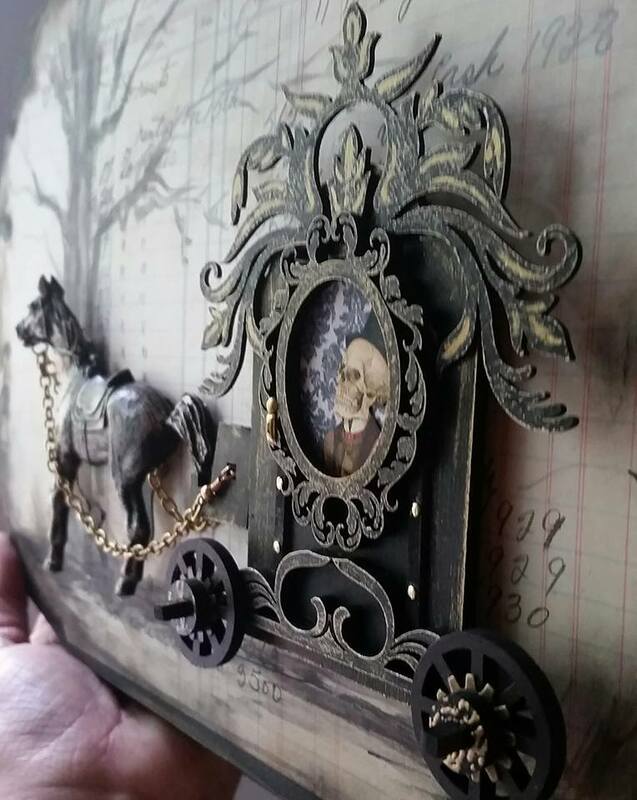 Kim Rayko will have you walking the plank with her fabulous skeleton assemblage! 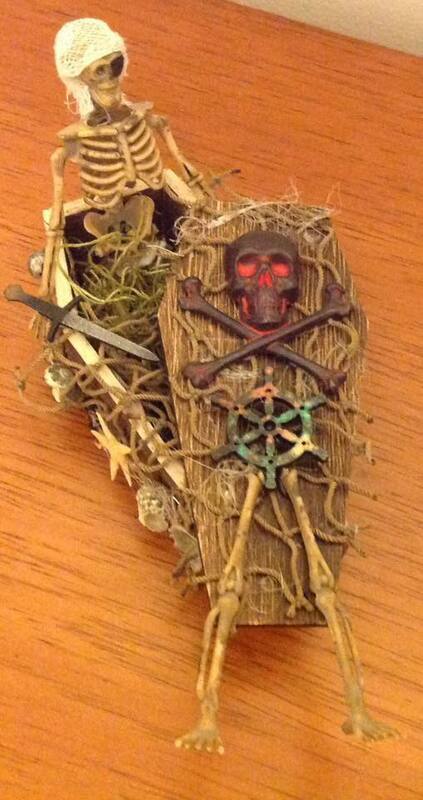 We love his pirate gear, and of course all the wonderful embellishments! Awesome piece Kim! 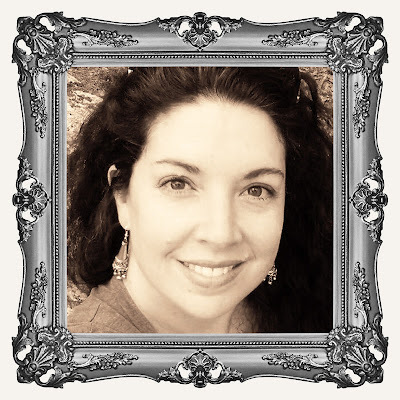 Welcome to the Design Team Sherry Matthews! 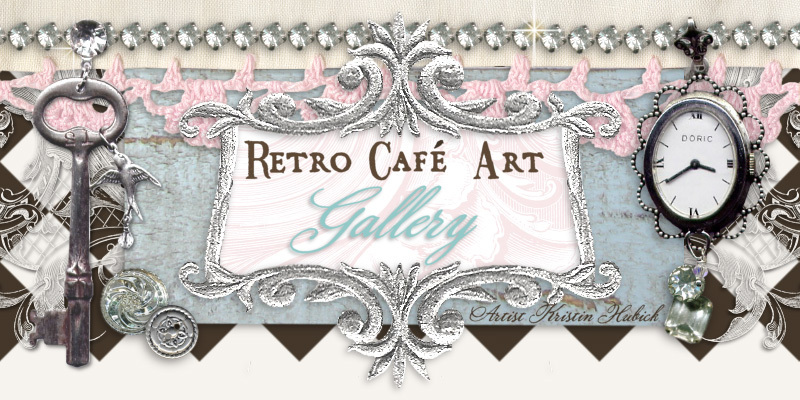 We're absolutely thrilled to welcome artist Sherry Westfall Matthews to the Retro Cafe Art Gallery Design Team! 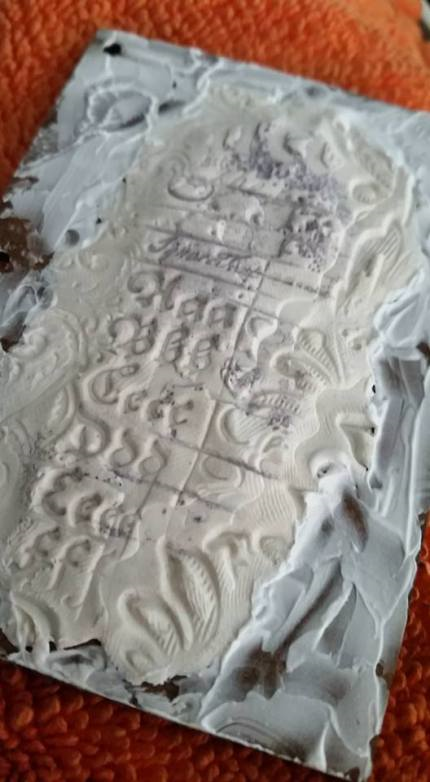 Many of you have seen how talented Sherry is, and have watched her work her magic on our goodies in the past! Of course, you'll be seeing even more of her stunning creations in the months to follow! Please help us in welcoming Sherry to our stellar team! We are very excited and look forward to sharing her amazing work with all of you! Sherry Westfall Matthews is a self-taught Southern artist who lives and creates in Alabama with the support of her two kids, three dogs, and a cat. 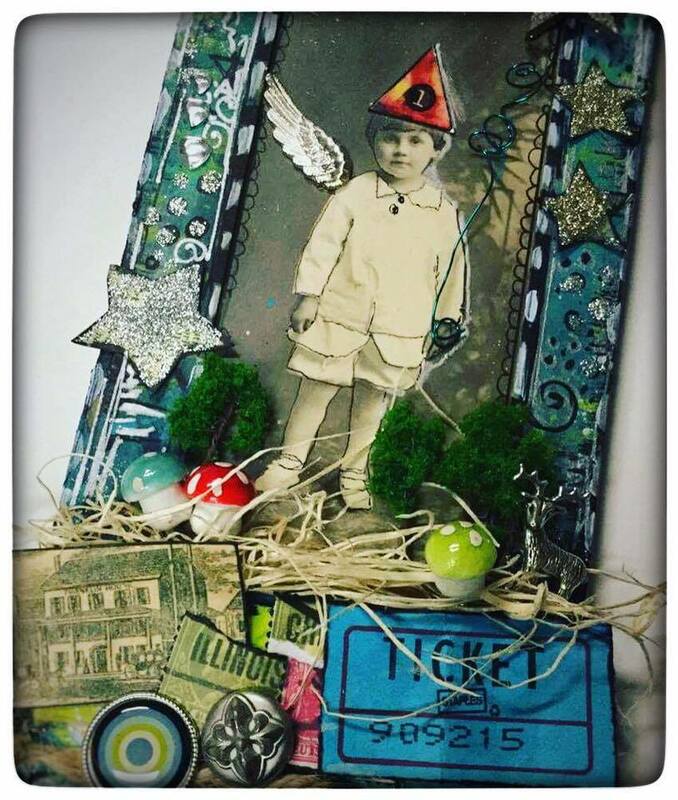 Sherry believes creating art keeps you young at heart through looking for the magic of inspiration in the world around you and continuing to grow by experimenting with new art techniques and products. She is a long-time loyal Retro Cafe Art Gallery customer (she says that's where the Art Supply Fairy lives!). Her work has been featured in numerous publications including Somerset Studio, Holidays & Celebrations, Somerset Gallery, Art Doll Quarterly, and Jewelry Affaire. You can see more of her work at dalaimomma.etsy.com or check out her blog at sherrymatthewsart.wordpress.com. You can also follow her on Instagram (@sherrymatthewsart) or find her on Facebook at Sherry Matthews Art/Dalaimomma. 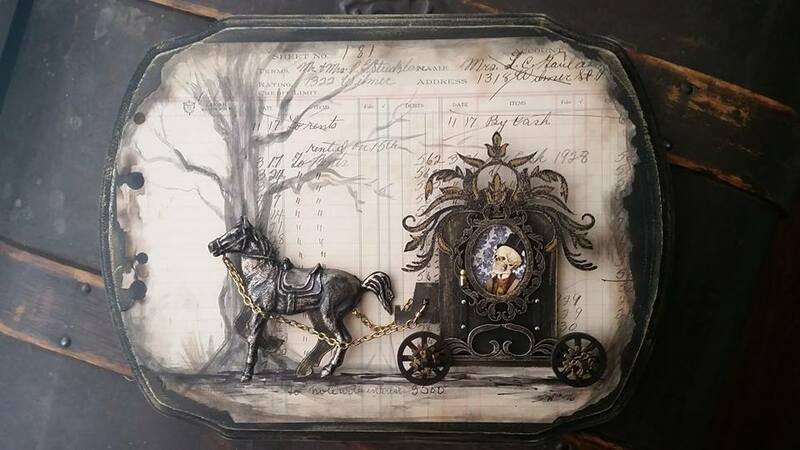 We are absolutely in love with this incredible piece by Sherry Westfall Matthews! 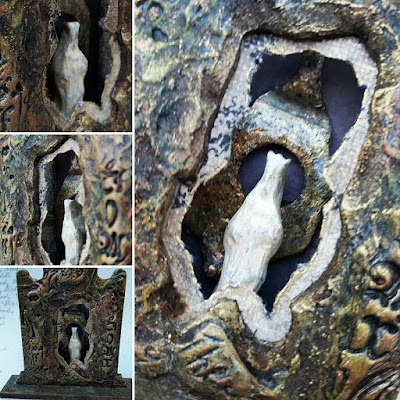 The way she transformed her 2016 Tombstone, is absolutely amazing. Time to ride right into Halloween folks! 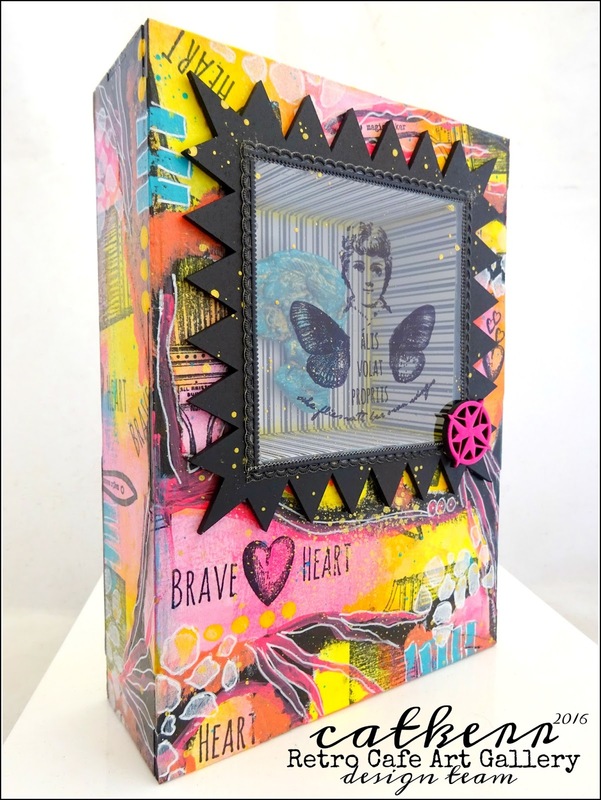 Stunning piece Sherry! Once again, welcome to the team Sherry Westfall Matthews!!! We can't wait to see even more of your incredible talent! We can't wait to see what you create with the New 2016 Tombstones! Find all of the details HERE! Happy Weekend Everyone! 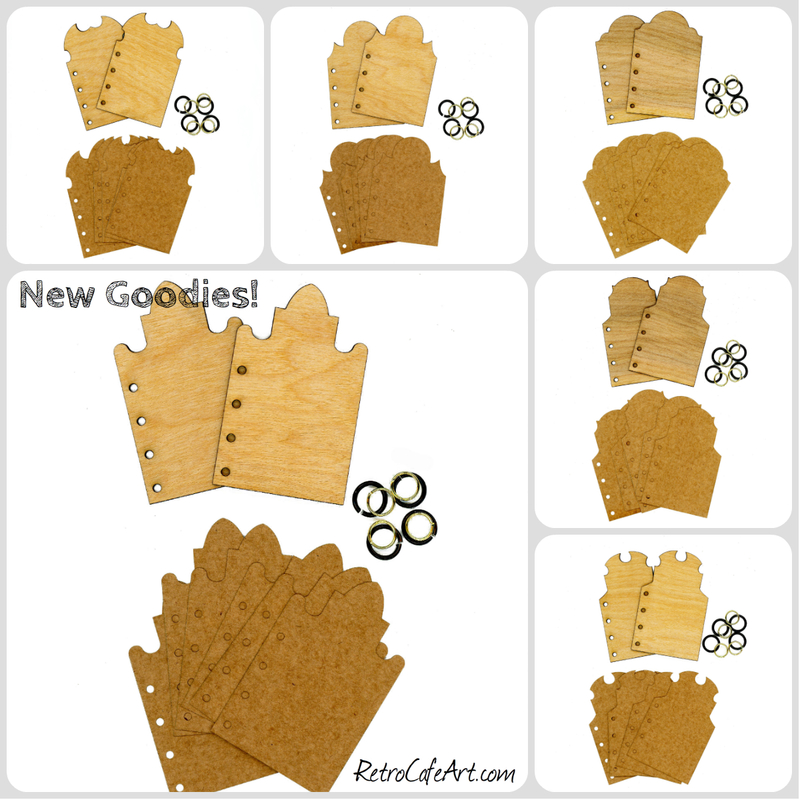 We have some fun new goodies in the shop! 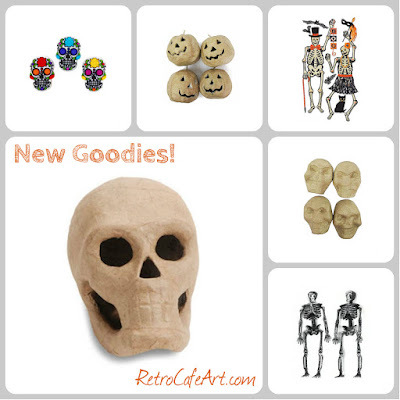 I'm really loving the Paper Mache Skulls and Pumpkins! With a little bit of paint (and maybe some glitter and rhinestones), they will really come to life! 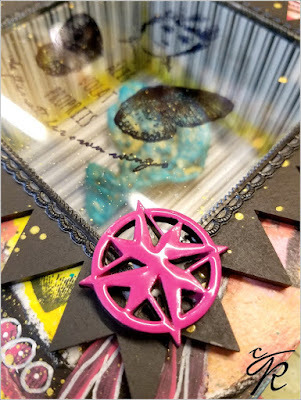 See a cool painted sample here! 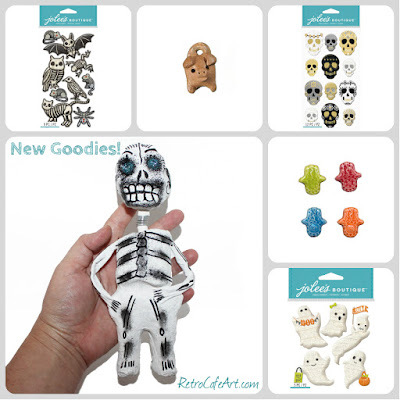 We also have several other fun skeletons themed goodies, and lots of amazing back in stock items! 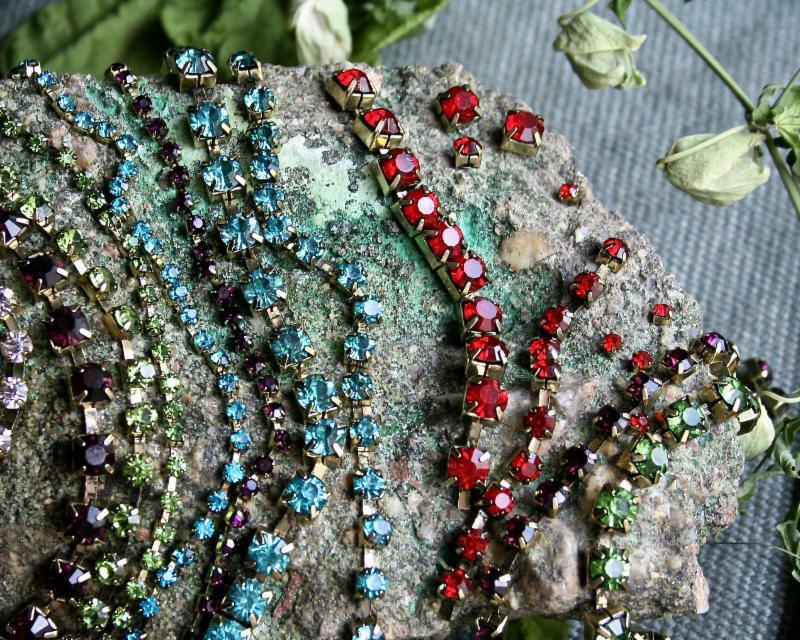 Above is a great shot of the new Sandra Evertson Bohemian Jewels just listed in the shop last week! Sandra sent me this photo, and I had to share it with you! Get some jewels for yourself HERE. 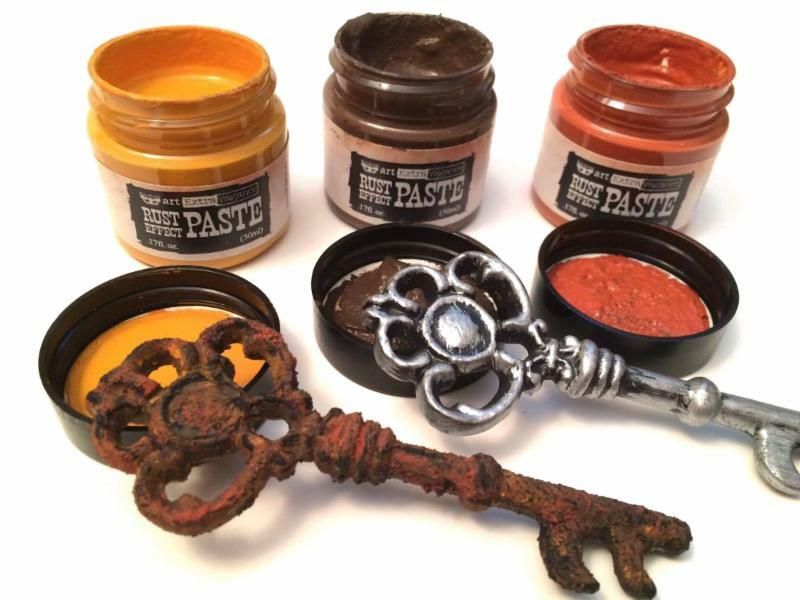 And the long awaited RUST PASTE is finally back in the shop! We've been waiting for a bit, so grab some while you can. An adorable Tiny Mermaid Assemblage by Karenliz Henderson! 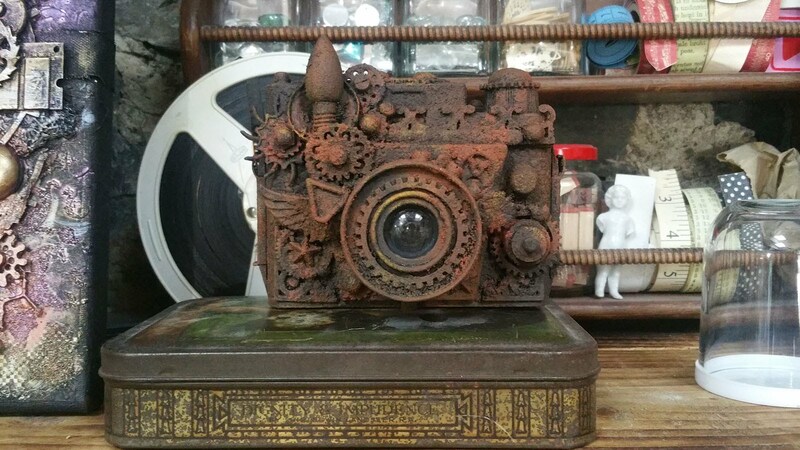 We love everything about this piece! The seashell, the glitter, the wild hair! Perfect for a Monday don't you think? Absolutely fantastic Karenliz! 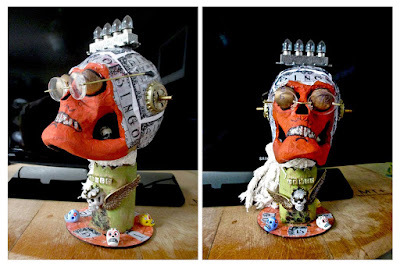 A sweet Mini Santos by Josefina Freidwall from Sweden! We love her entire piece, but we especially adore her elevated bird added to the cage. And her doll's Dresden arm cuffs! 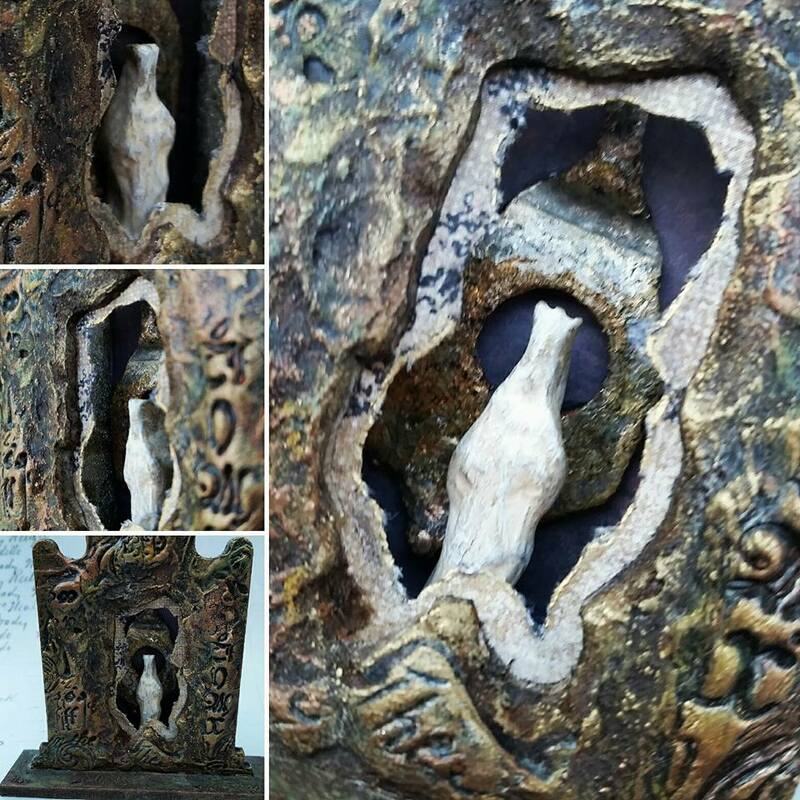 Awesome piece Josefina! 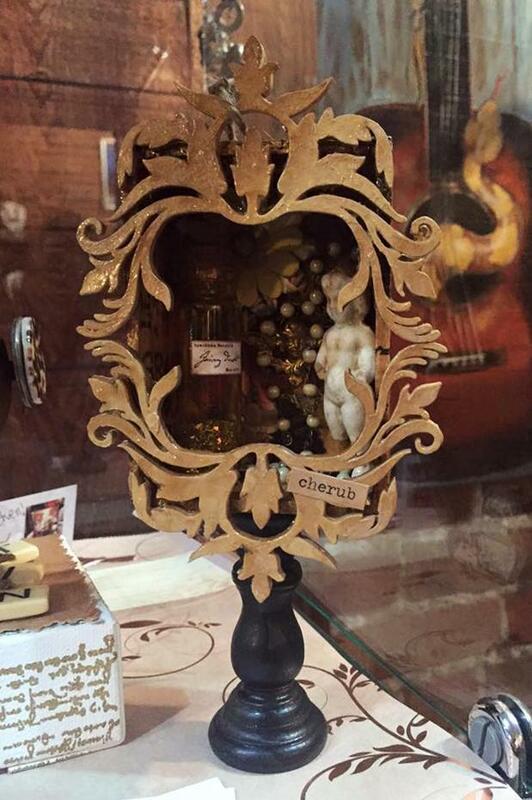 A stunning Flourish Shrine by Rebecca Sandbek! 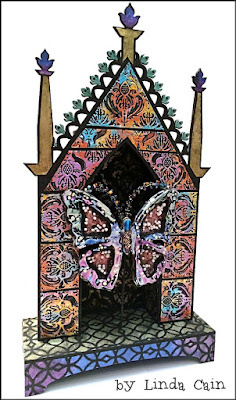 This gorgeous shrine is packed with so many awesome objects, and the color scheme is perfect! 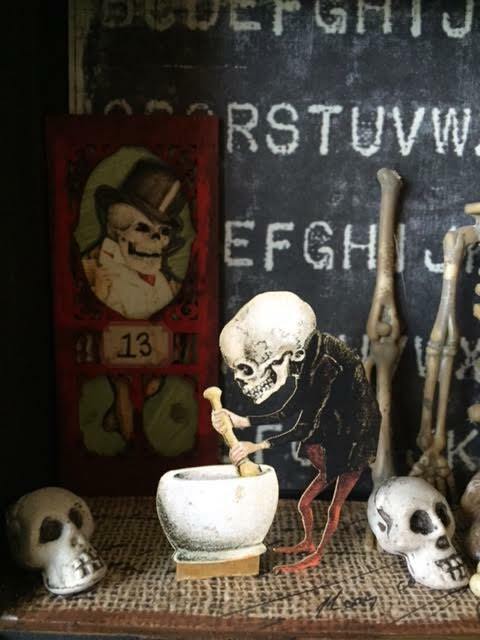 These are great little shrines for Halloween or any theme really! Fantastic job on this beautiful piece Rebecca!